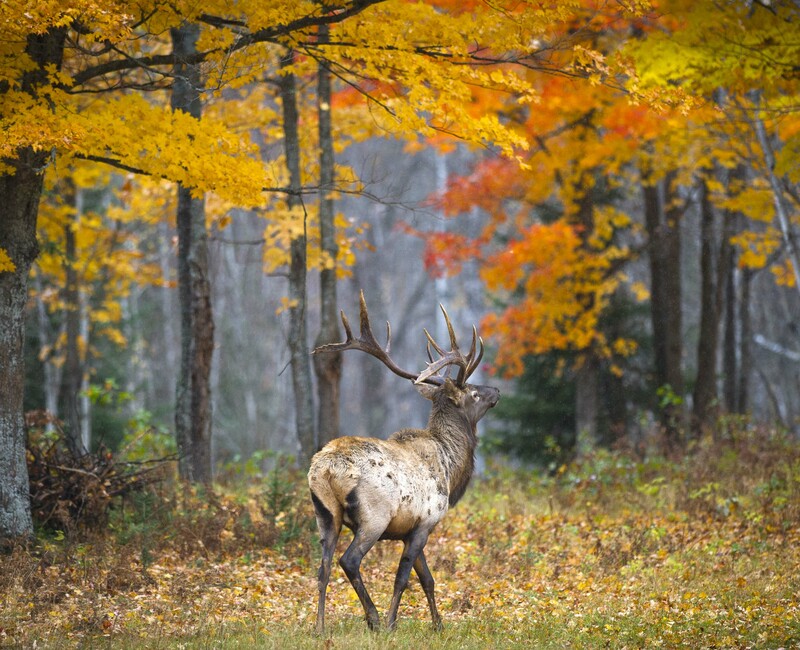 As Michigan celebrates the 100th anniversary of elk reintroduction to the state, we should recognize that this is not just a wildlife story but one which is also about people…and place. Had there not been a vast block of largely uninterrupted semi-wilderness lands, and had there not been generations of both natural resource professionals and citizen-conservationists, this remarkable success would not have been achieved. In terms of place, consider the fact that of the eleven states where elk reintroduction was attempted 100 years ago, that effort was only successful in two (Michigan and Pennsylvania). It is not a coincidence that it was also 100 years ago that a visionary named P.S. Lovejoy advocated for the creation of a place he called the “Big Wild” which became home to these iconic animals. Lovejoy called for an increase in public land holdings around what became known as the Pigeon River Country State Forest and, thanks to hunting license dollars, it grew from 6,500 acres in 1919, to nearly 20,000 ten years later. In the decades which followed, the citizens of this State continued to build upon Lovejoy’s vision; the public land portion of Pigeon River Country now stands in excess of 100,000 acres. But this place upon which elk restoration was dependent was not limited to public ownership. Pigeon River Country was bounded by even larger consolidations of private ownerships which required an equivalent level of support and cooperation. Looking back through the lens of hindsight, it now seems obvious that a successful elk restoration effort would require broad-based public support, and that social science is also an important component of wildlife science. It was not, however, until this balancing of people and place was fully achieved that the word “success” could be confidently used. As we know, elk restoration did not follow a straight-line trajectory. Even 60 years after reintroduction, an alarming decline in elk numbers occurred in the early 1970’s. It was during this time that the intersection of people and place proved to be the catalyst which resulted in a sustainable elk population. In addition to the drafting of Michigan’s first Elk Management Plan, the events associated with oil and gas development in Pigeon River Country resulted in the creation of the Pigeon River Country Advisory Council together with its first Concept of Management – all of which occurred during these early and mid-1970’s. Although an additional conservation officer was assigned to the area at that time, success would not be achieved until the citizen-conservationists who resided in the surrounding communities were no longer willing to turn a “blind eye and a deaf ear” to incidents of poaching. During the 10-year period which followed this critical time in the 1970’s, the elk population increased from an estimated 200 to nearly 1,000. Since that time, we’ve seen the elk herd flourish. While many uncertainties lie ahead, we can be comforted by the knowledge that we continue to have the people, and the places, to face those challenges.